Price request for RM 50-03 McLaren F1Ref. 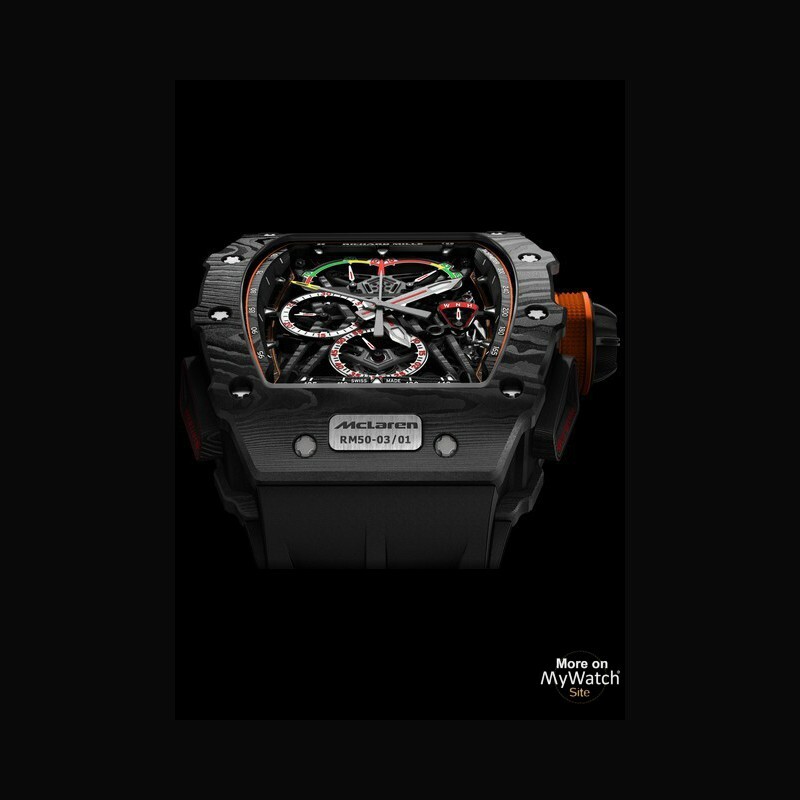 Relentless technical innovation, the quest for perfection, and a perpetual hunger for progress are the common factors that link McLaren-Honda and Richard Mille. 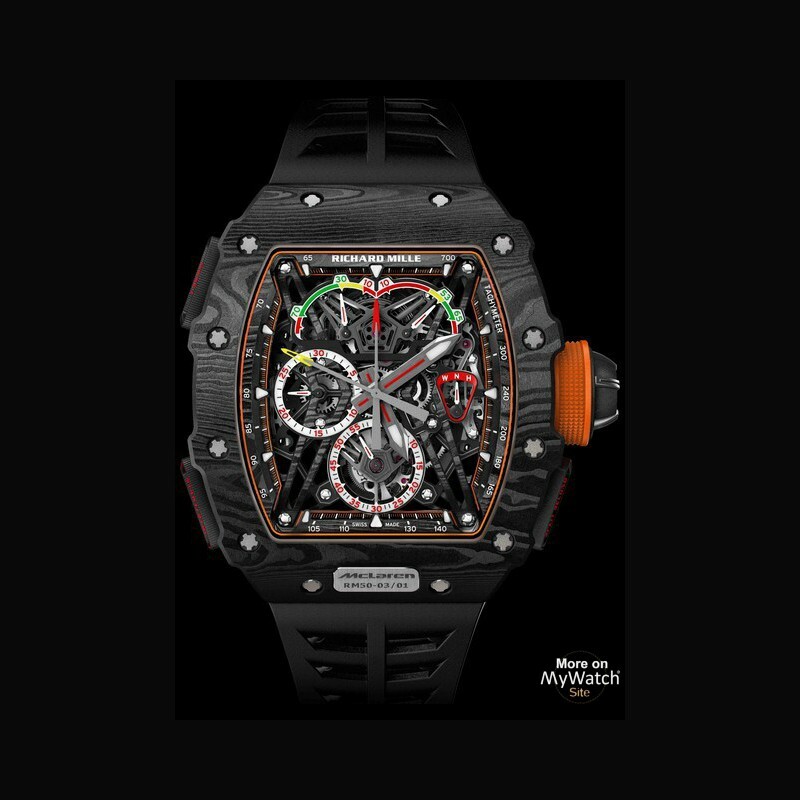 Produced in collaboration with the famed Formula 1 constructor, the new Richard Mille calibre is a technical masterpiece offering off-the-chart mechanical performance. The RM 50-03 tourbillon split seconds chronograph ultralight McLaren F1 weighs less than 40 grams – including the new strap – which makes it the lightest mechanical chronograph ever made. This landmark has been achieved through the use of cutting-edge technical materials. The design not only incorporates Titanium and Carbon TPT™, but also introduces an entirely new material into the world of watchmaking: Graph TPT™, more commonly known as graphene. These new applications for the material emerged through research at the National Graphene Institute, established in 2015 at The University of Manchester. It’s where graphene was first isolated by Professor Andre Geim of the School of Physics and Astronomy, back in 2004. Six years later, the discovery earned its author the prestigious 2010 Nobel Prize in physics, alongside his colleague, Professor Konstantin Novoselov. 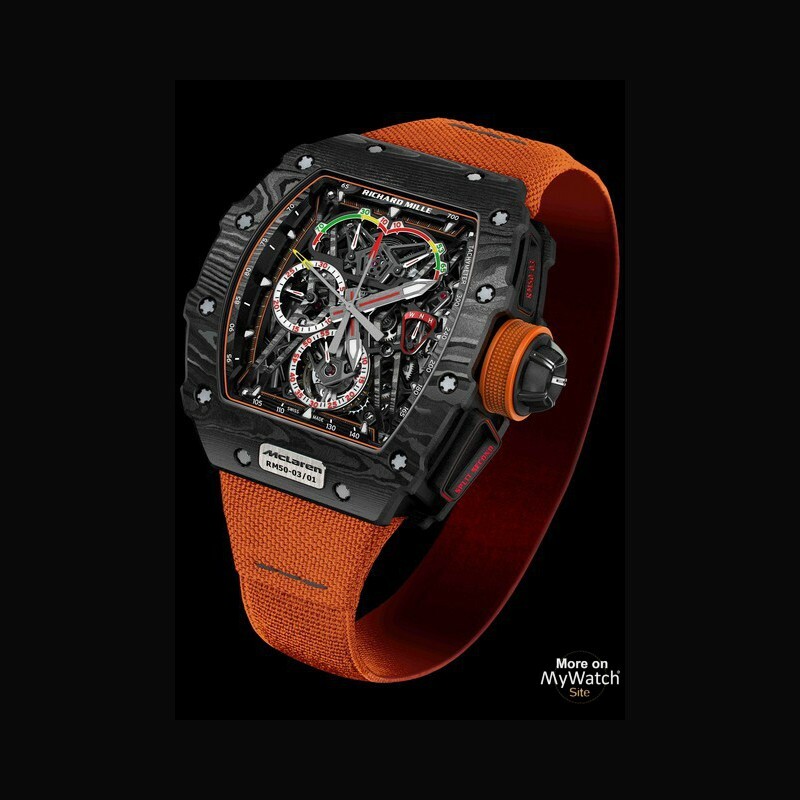 Thanks to the collaborative work between The University of Manchester, McLaren Applied Technologies and North Thin Ply Technology (NTPT®), Richard Mille has succeeded in producing a watch case machined in an improved form of Carbon TPT™. The carbon’s physical properties were significantly enhanced by the introduction of graphene, a revolutionary nano-material which is six times lighter than steel, and 200 times stronger. McLaren Technology Group and McLaren-Honda, which are currently working on integrating graphene into their Grand Prix cars, made it possible for us to consider this material as a means to significantly low the density of our carbon composite while increasing its resistance. Convinced of the incredible advantages conferred by graphene, our engineers worked with those at North Thin Ply Technology to envision practical applications of the new material, and studied how to incorporate it into Carbon TPT™. Noted for the beautiful, undulating striations of its surface, Carbon TPT™ is comprised of parallel filaments – 600 layers, in fact, whose maximum thickness is 30 microns. These are impregnated with a super-charged resin containing graphene, and are then compiled by a CNC machine that shifts the orientation of the fibres by 45° between layers. The composite is then solidified by heating it to 120°C, at 6 Bar of pressure. 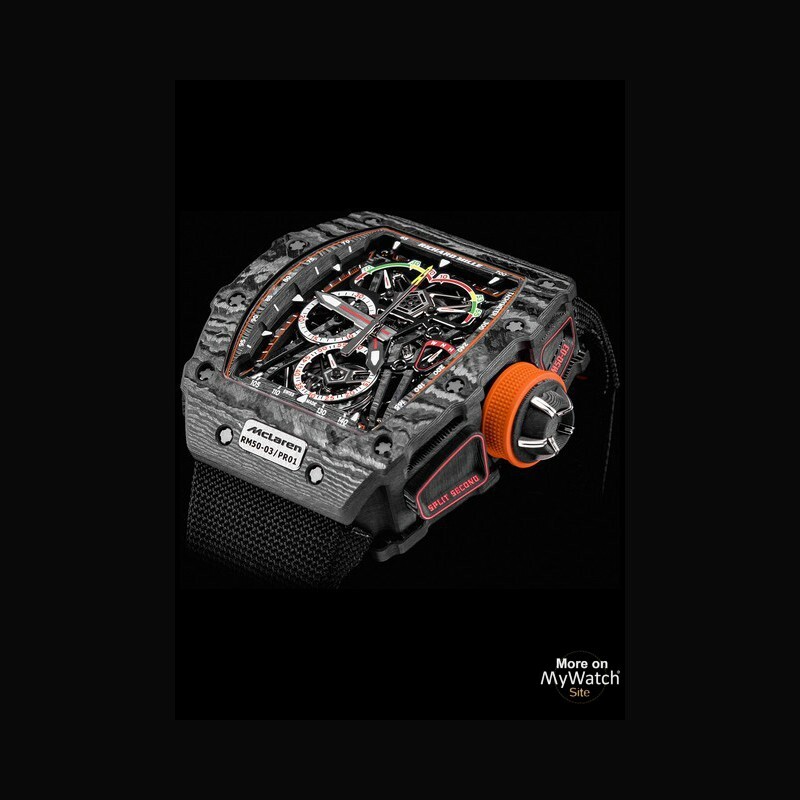 Numerous control and validation tests conducted by McLaren Applied Technologies have made it possible to develop the solutions that resulted in the production of Graph TPT™, a material employed exclusively by Richard Mille in the domain of watchmaking. 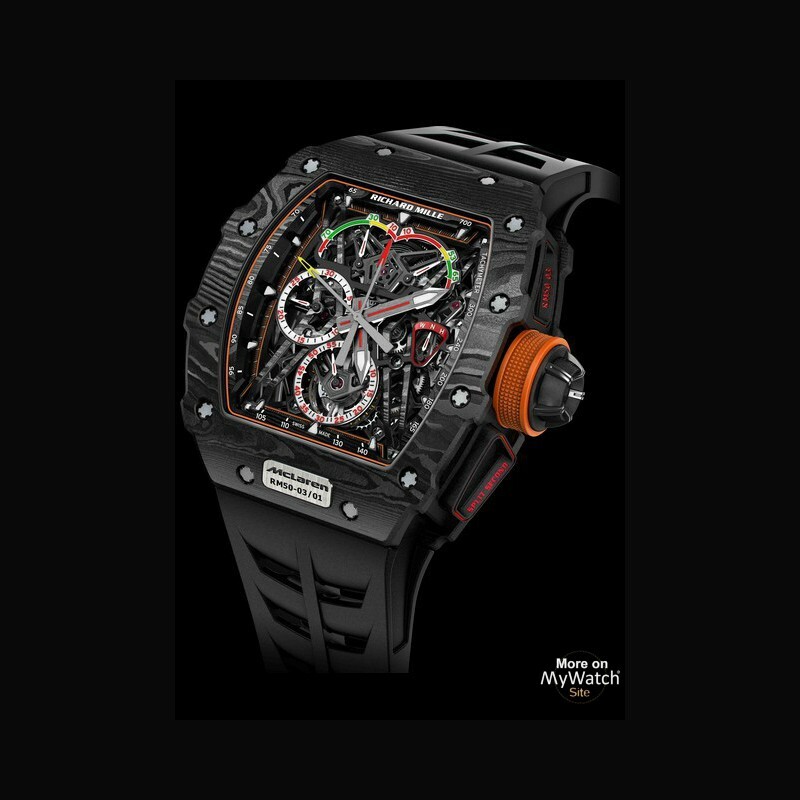 At the Richard Mille manufacturing facility, our team specialising in the machining of movement components and cases turned their attention to manipulating Graph TPT™— spending many long hours creating and programming cutting tools suitable for achieving precision to a micron. The resulting three-part case cedes ground nowhere, being both highly resistant and extremely light, while preserving perfect ergonomics and a unique, striking appearance. For its part, the 7-gram movement completely deserves the qualifier ‘ultralight’. The secret to its feather weight lies in the use of grade 5 Titanium and Carbon TPT™ for the baseplate and bridges, and in the extreme skeletonisation of components. Likewise, the density, stiffness and low thermal conductivity of Titanium make it a material of choice in McLaren Racing’s Formula 1 engineering build programme, where it’s not only used to lighten and reinforce chassis and aerodynamic elements, but also to produce gearboxes, connecting rods and valve systems. A transverse cage, crafted of Carbon TPT™ and inspired by the wishbone suspension structure of a McLaren-Honda Formula 1 car, is affixed to the caseband, and supports the entire RM50-03 calibre. 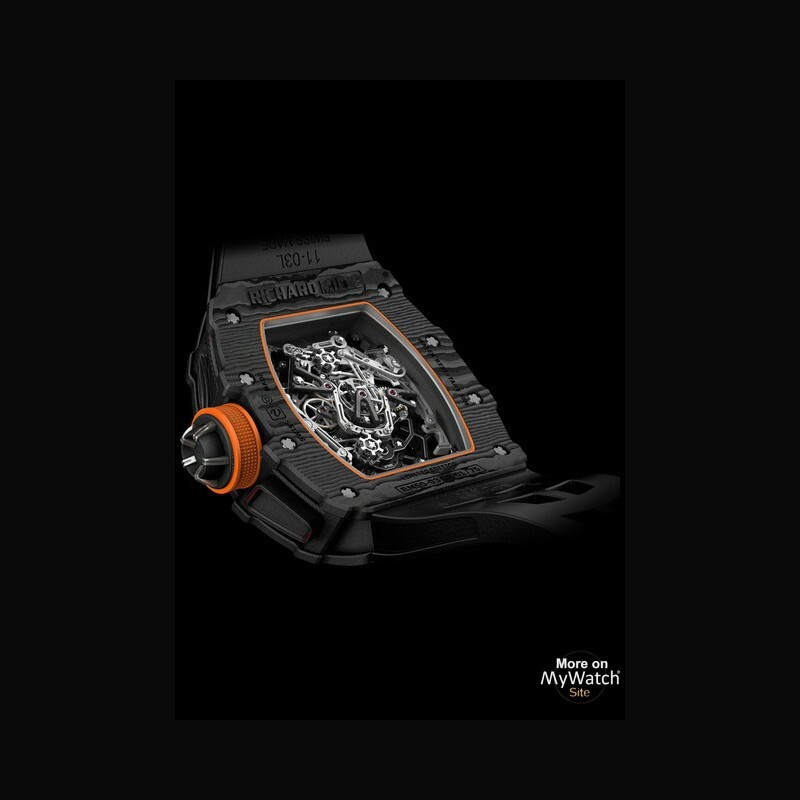 By eliminating the casing ring, this unusual architecture enables a perfect fit between the movement and case. Taken together, these technical solutions provide the complex calibre with tremendous resistance properties. Indeed, the casing has withstood shock loadings of 5,000g in our own workshops – and survived unscathed. The RM 50-03 McLaren F1 is chronographic perfection brought to life: it combines a tourbillon escapement with a split-seconds function. In order to perform without fail, the combination of these two complications within a single mechanism demands perfect transfers of energy. The ensuing need to reduce friction led to research on how to improve the profiling of the teeth on the barrel and gear train. The result is superbly balanced torque and optimised yield. The movement’s performance and the quality of the energy delivered can be easily read via coloured indicators denoting the 70-hour energy reserve and torque sensor. 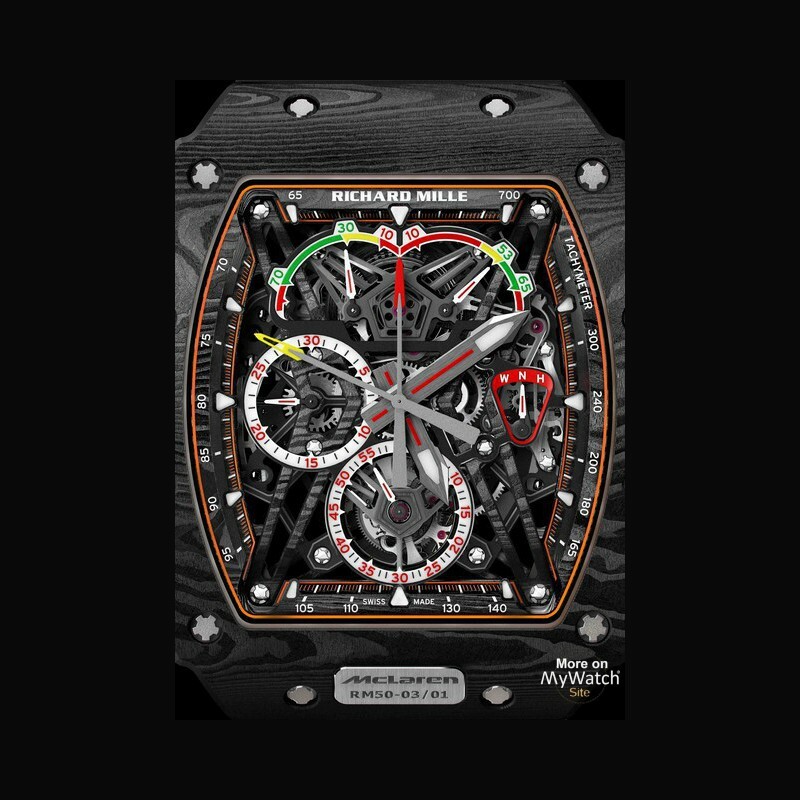 The hollow pushers of the chronograph are representative of the air intake ducts on the McLaren-Honda car, while the shape of the crown takes its cue from the racing competition wheel rims used by the British team. Design of a new split-seconds mechanism and extensive research on the work of the split-seconds clamps have permitted a 50% reduction in the chronograph’s energy consumption, while at the same time reducing arbor friction. The 6-column wheel that controls the various rockers for the split-seconds function was designed to guarantee flawlessly simultaneous movement, clean function lock, and highly stable settings. 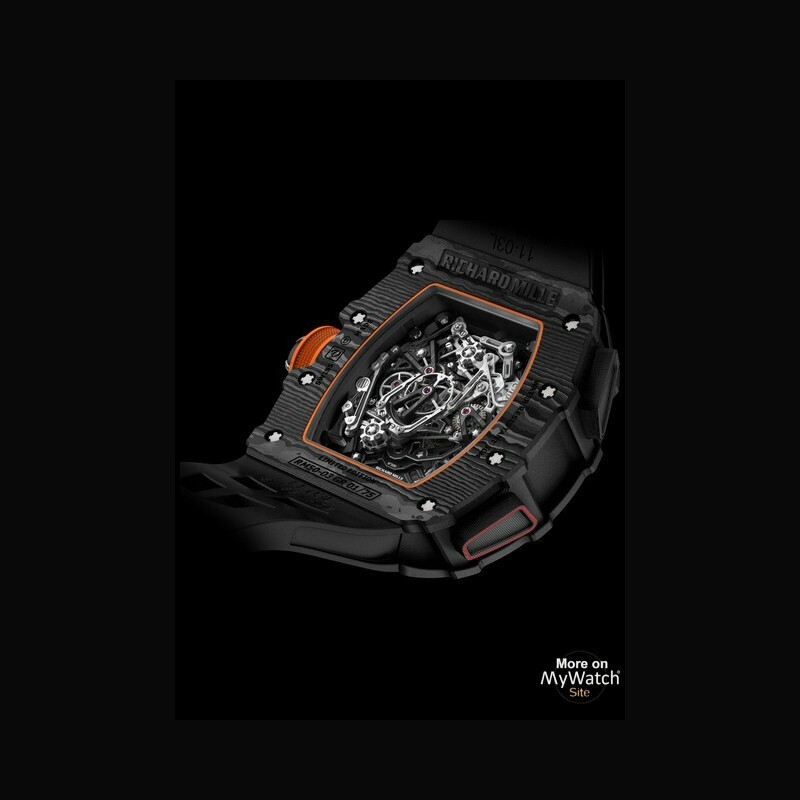 The extraordinary properties of graphene encouraged us to pursue additional developments in conjunction with our strap supplier, BIWI S.A., and to incorporate this nano-material into the rubber strap of the RM 50-03 to increase its elasticity and resistance to wear. 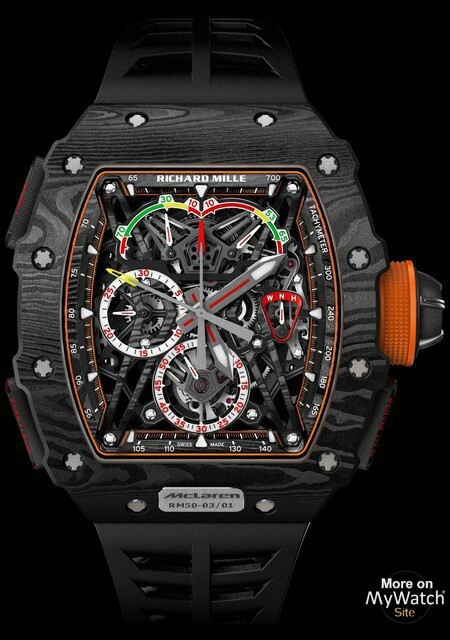 These various applications of graphene represent significant technical advances that are of capital importance for both Richard Mille and McLaren-Honda. 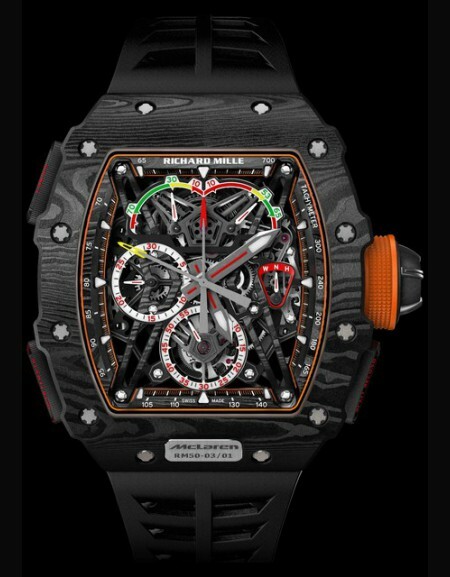 The RM 50-03 McLaren F1 will be produced in a numbered limited edition of 75 pieces and will be available only at Richard Mille boutiques. 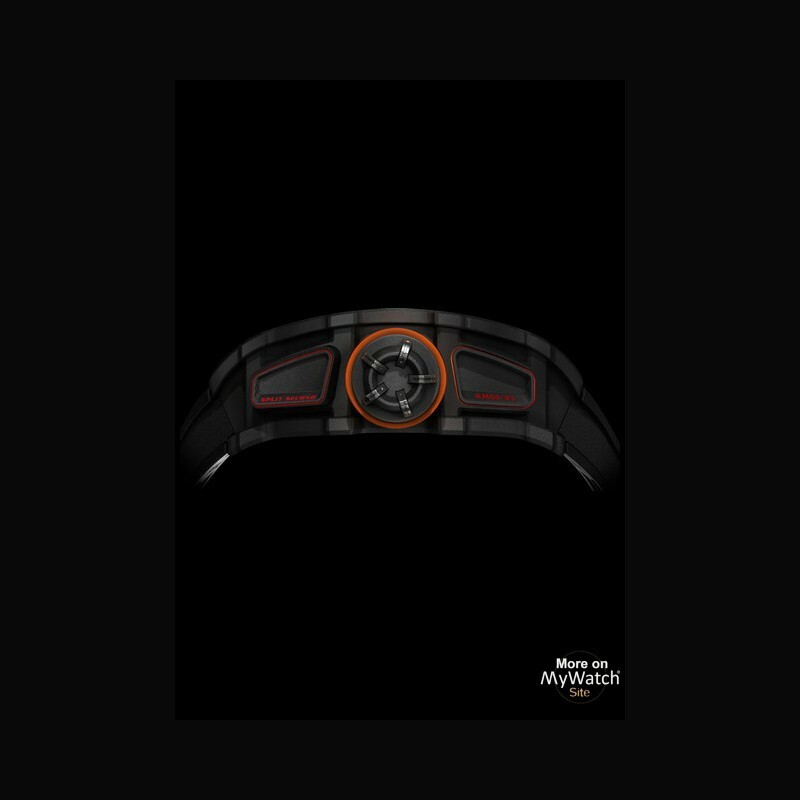 Each watch will be accompanied by a 1:5 scale model of the McLaren-Honda racing car driven in 2017 by Double-World Champion Fernando Alonso and Stoffel Vandoorne.